Robust capital investments in global exploration and production (E&P) projects in 2014 should keep new orders buzzing for Singapore's offshore and marine sector this year, although rising costs and competition could crimp margins. Potentially higher labour, materials and equipment, utilities and premises costs are among the key factors that companies are keeping a watch on, and hope to keep in check, according to industry stalwarts and analysts. A learning curve for new vessel types could also be an initial dampener on margins. Higher funding or borrowing costs could also be on the horizon as the US Federal Reserve initiates tapering of its bond buying programme from this month, particularly for those who did not lock in funding on still attractive terms offered last year. For the capital-intensive industry such as the offshore oil and gas businesses, this will be something to contend with. Still, the earnings outlook for 2014 remains bright for leading offshore rig and vessel builders such as Keppel Corp and Sembcorp Marine. At the close of 2013, they built up record net order backlog of over $15 billion and $13.8 billion respectively. Analysts expect the record order backlog for the two yards to help bolster earnings in 2014 and into 2015. "This is the largest ever order book for Keppel, a 17 per cent growth on 2012-end order book, and would drive a significant 18 per cent profit growth over 2013-2015," said Macquarie Equities Research analyst Somesh Agarwal. As for new orders secured in 2013, Keppel's offshore & marine division closed 2013 with $7.1 billion in new orders, while SembMarine's was $4.2 billion, most of which were for offshore jack-up, semi-submersible rigs, accommodation vessels and offshore platforms. For 2014, analysts are forecasting that the two groups should be able to sustain new orders at relatively creditable levels despite the robust orders secured in 2013. Deutsche Bank's Kevin Chong said: "Keppel appears well positioned moving into 2014 as more contracts could be secured with major drillers and national oil companies. Potential contracts worth US$3.7-4.1 billion versus our estimate of S$7 billion may be won in 2014, just based on a few recent major agreements and options." Macquarie remains equally positive, having raised its 2014 new orders estimates to $6 billion for Keppel, from an earlier estimate of $5 billion. Deutsche Bank also expects SembMarine to secure $5 billion in new orders in 2014 versus $4.2 billion secured in 2013, as increased capacity in its new integrated shipyard comes onstream. DBS Vickers Securities is also upbeat on SembMarine's new yard, saying that it "opens up new opportunities and target markets for SMM, as the yard is equipped with four VLCC drydocks with total capacity of 1.55m dwt". "SMM is well-positioned to take on repairs of larger vessels, leading to higher contract values per vessel," said DBS Vickers analyst Janice Chua. "The new yard should be positive for margins in the long run, due to increased efficiency, reduced docking time, lower wastage and improvement in logistics." Analysts remain positive on Keppel with 20 buy ratings and just seven holds, according to Bloomberg. 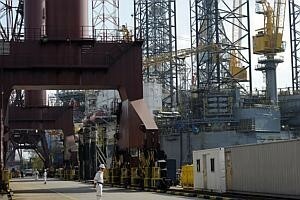 Keppel's FY13 earnings are due on Jan 23, with mean estimate net profit at $1.51 billion. The global outlook for capital expenditure on new offshore oil-related contracts this year remains positive as well. On a global basis, oil and gas companies are estimated to spend some US$723 billion on exploration and production, an increase of 6.1 per cent from 2013, according to Barclays Bank's Global 2014 Exploration & Production Spending Update. Barclays expects growth in E&P spending in North America to rise more than 7 per cent to US$199 billion (led by the US), and expects continued growth in international markets (up 5.7 per cent at US$524 billion), particularly in the Middle East, Latin America and Russia. In its survey of more than 300 oil and gas companies worldwide on their spending intentions next year, Barclays found that spending in India, Asia and Australia is projected to post modest growth (up 3 per cent year on year) on solid spending increases from Petronas, Pertamina and ONGC. But this will be partially offset by declines from Inpex and Santos. Chinese national oil companies are planning mostly flattish spending. On the flip side, the Middle East, Latin America and Russia will show the fastest growth, with the Middle East being the fastest-growing oilfield services market at more than 14 per cent in 2014, led by Saudi Aramco and Kuwait Oil Company. Exploration and production companies are basing their spending budgets for next year on oil prices of US$98 per barrel for Brent and US$89 per barrel for West Texas Intermediate, and a benchmark natural gas price of US$3.66 per British Thermal Unit. According to Barclay's, this could mean that E&P spending could be higher as current price levels are already higher than the base price used for their projections.